Day 3! Feel like the holiday is over already. So fast now we had 1 last day in Bali before our return flight to Jakarta tomorrow. Yeah, no New Year in Bali this time. We have our family waiting at home. But at least we had one last amazing Bali sunset for the day. 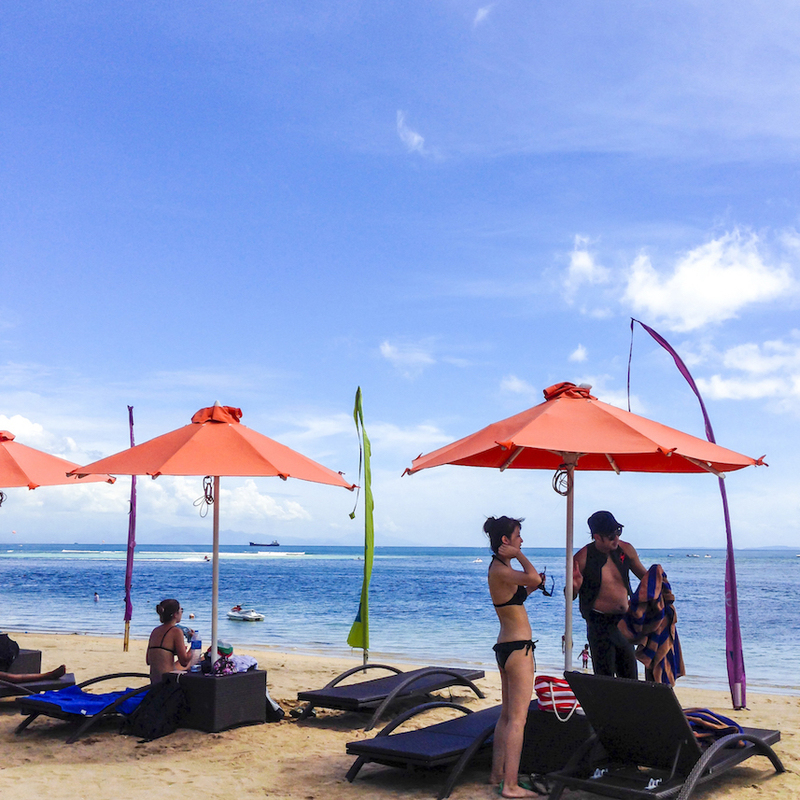 Today we leave early around 8.30, for Tanjung Benoa water sports. Yeah! It’s one thing that I’ve been waiting, water sports. Buying Pia Legong From Who? We made a stop to buy the one and only Pia Legong. For you who never tried Pia Legong, it’s basically a pastry stuffed with beans, or chocolate, or cheese. This brand is insanely famous, especially for Indonesian tourists. They sell limited pia per day, they limit their customers for only 2 boxes/person. The queue is amazing when we got there, considering the scorching heat from the sun. And it’s still morning, by 10 o’clock, they ran out of pia, so they count the people in the queue and cut those who won’t be able to get any pia. D*mnn…. I never knew selling pia could be this extreme. Luckily, we’re in the queue that still counted get the pia. Remember 2 boxes/person. I don’t really bother to buy because I tried it and for me, it’s not that sensational that will make me queue like some sort of duty or obligation when you go to Bali. Another mind-blowing fact, there’s actually locals who lives nearby that queue to buy that pia, just to sell it back to tourists for a higher price. R u serious? And both my friends bought from them because obviously, 2 will never be enough for Asian big family at home, huh? Updated price IDR 150,000 / box official price (We bought it for 125K & 130K). With these people the selling on street, it’s up to 200K. What a mark up. And yes, people still buy. Plus, they sell it right in front of the Pia Legong store itself, literally just at the street. Back to the beach. 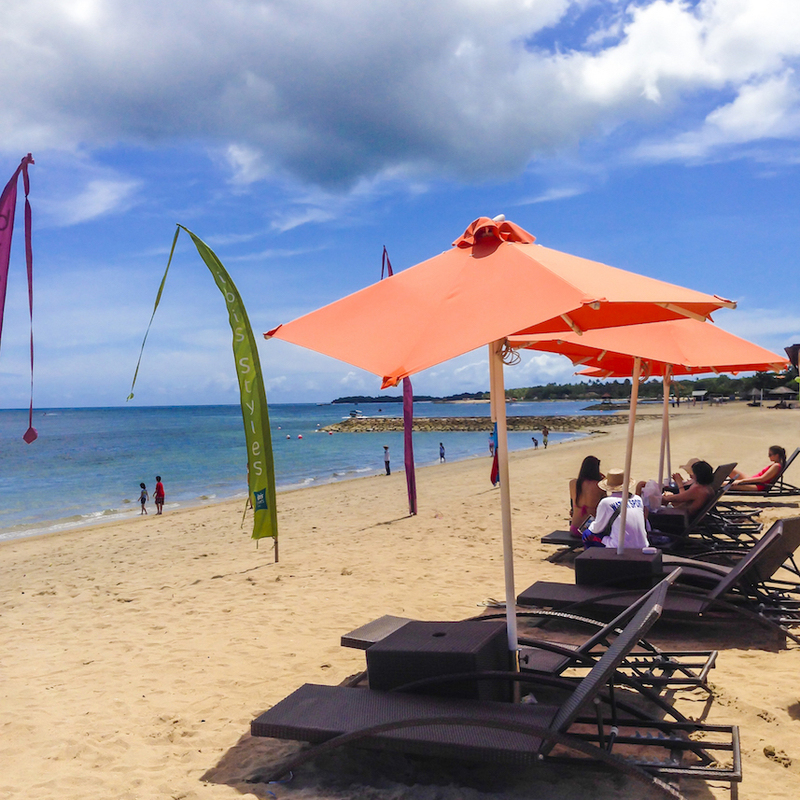 Tanjung Benoa located at the south Bali, well known for hotels and restaurants. They’re also well known for their water sports. Of course one of the best thing to have a local guide is that you can get a better deal, better places. In our case, our driver (one that my friend know after a couple of time using his service), took us to a hidden spot for water sport, the entrance was not really tourist-friendly, because we’re parking in an alley, somewhat like a private property. 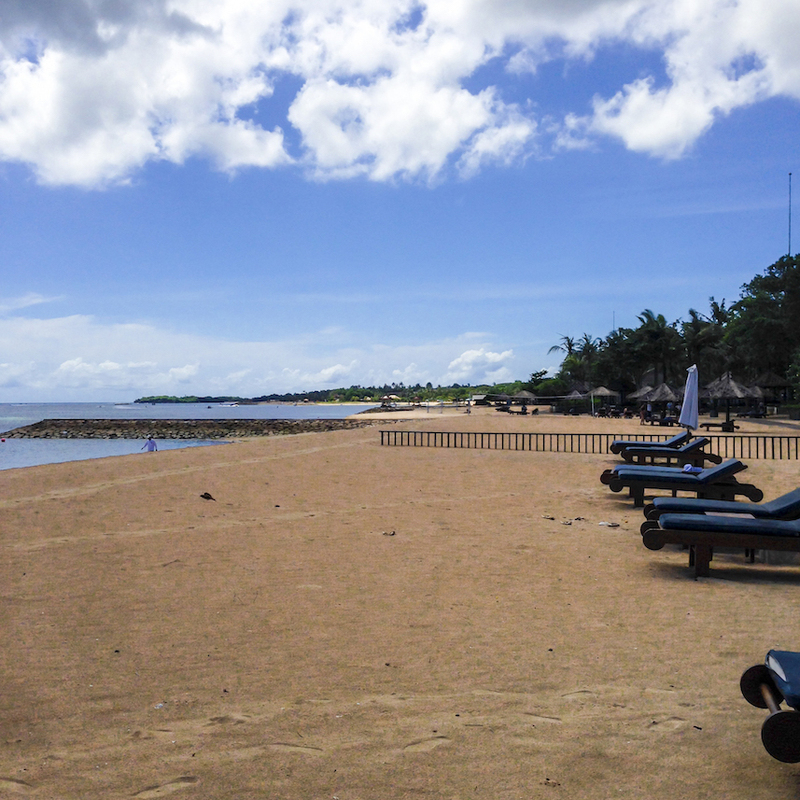 But it’s direct to the beach, just next to Conrad Hotel. So yeah, we can say we enjoy the Conrad private beach too without paying that extra money. Haha! So much win! I think the main reason he brought us to this spot because of the water sports operator that trying to sell us their service was his family or friends, obviously. As soon as we get here, a guy welcomed us and handed us a price list. Hm, those prices are expensive but still acceptable. 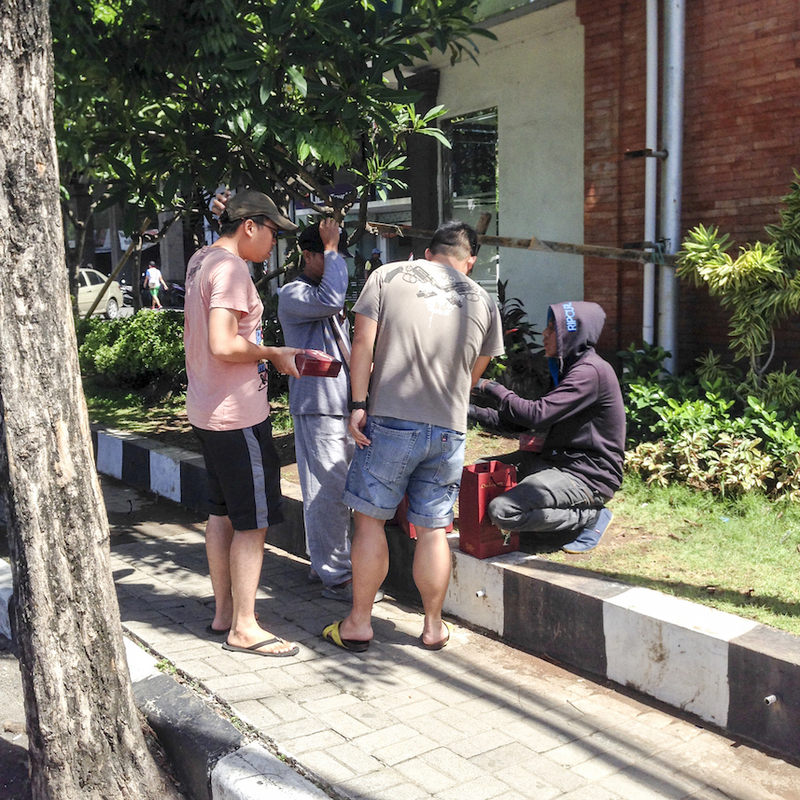 We had our driver to help negotiate the price and settled the deal at IDR 750K for snorkeling and jet ski. Pretty good deal. It’s better to play between 8 am to 3 pm, as the low tide happens after 3. So the water sports usually stop. First, we go with the snorkeling, they have the boat ready to take us to a deeper water. We were one boat with some college Australian girls, had a little chat. I would give the snorkeling experience for 7/10. It’s just I know that they could bring us to a better spot, but somehow they just went not really too far from the beach. It’s better to dive, I guess. You can rent these beach chair, but they give it for free is you spend a certain amount of money. There’s a lot of water sports you can do here. 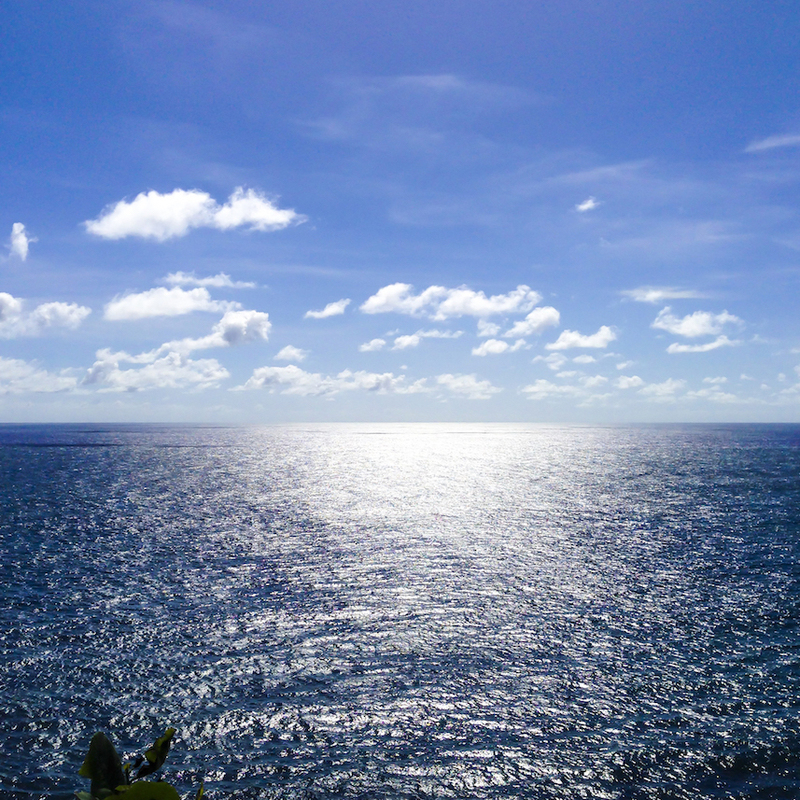 Such as sea walker, scuba diving, turtle island, etc. 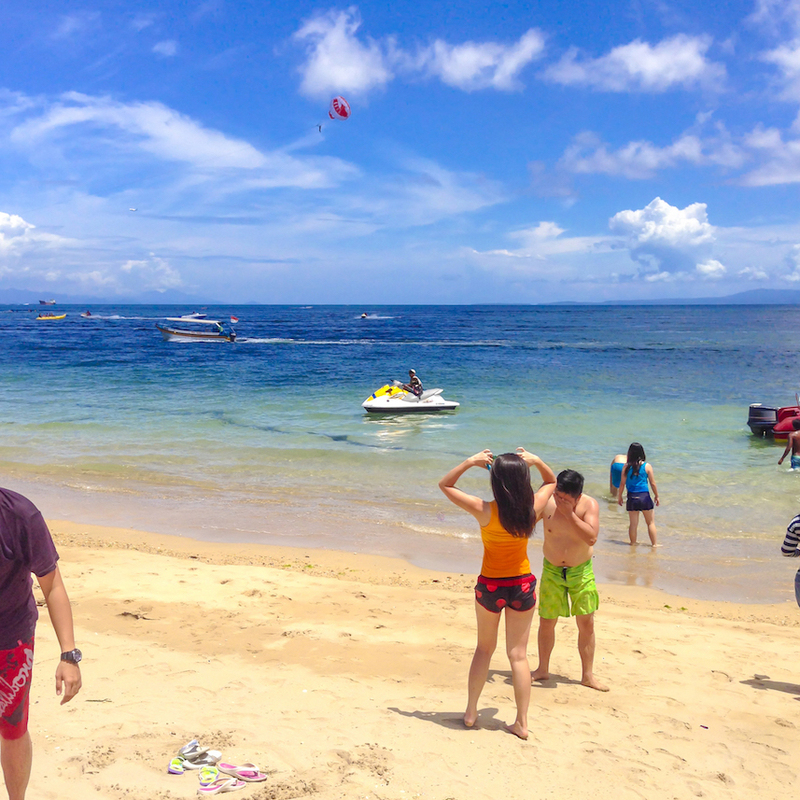 After 30 minutes of snorkeling, back to the beach with our jet ski waiting. We got an extra time for 15 minutes with a tip of 50K. Nice guy. I did enjoy the jet ski so much, from one point to another point, we do as much as we can with that time window. Always love the jet ski. It shows 1 p.m., time to get a shower and leave. They provide a shower just behind the hut, or a changing room close to the food stall. Of course, they’re free if you buy the water sports. It seems more tourists coming, as the beach starts to get more people. We went for lunch, but this time I had no pictures (maybe we’re just too hungry, don’t bother…). 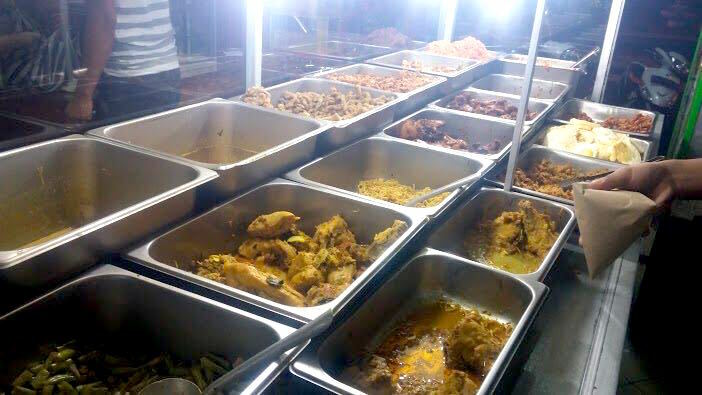 We asked our driver where would he recommended us for lunch and Mr. Made brought us to this place, Iiga Warung. It’s one of the best pork ribs I have ever had. Bali has become so well-known for their pork ribs recently, a lot of culinary coming into existence with the porks menu. And of course, tourists love it. We ordered pork ribs, and pork ribs soup. Those ribs are delicious, tasty, sweet, and suits our tongue perfectly. The BBQ sauce was superb, and they soak to the meat very well, perfectly cooked. I definitely recommend this place. 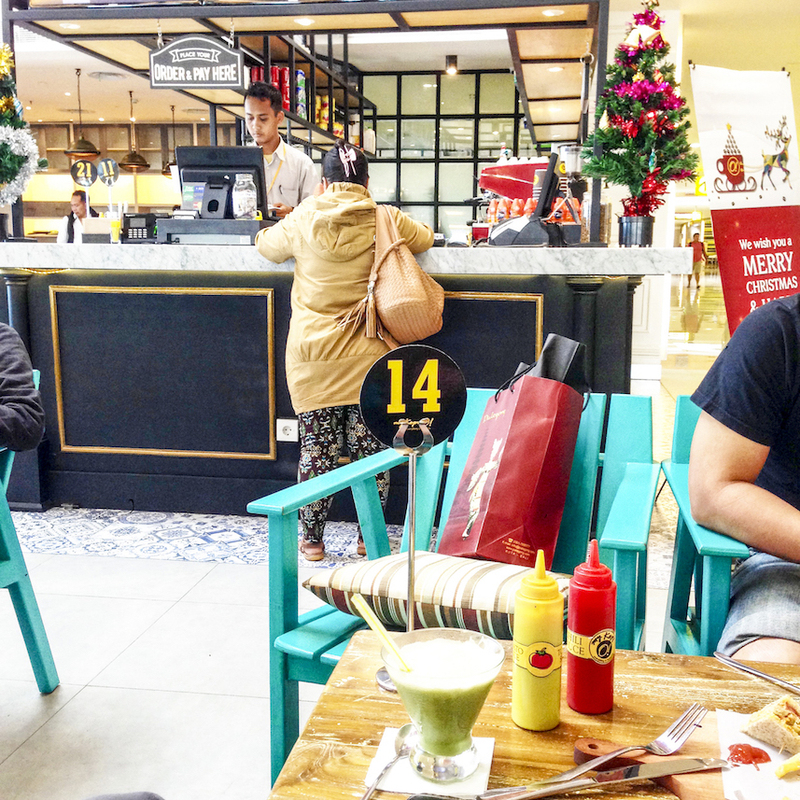 We spent IDR 455K for those ribs plus rice, drinks, and banana fritter. Lots of tourists coming here, and it’s packed during lunch time. I guess a lot of driver or guide bring tourists here for a small commission. There’s actually a lot of debate going in Bali between the best pork ribs. If you ever heard Nuri’s or Wahaha, yeah they too, serve the best pork ribs in this island. Some say Nuri’s better, Wahaha better, but I say the fastest one you can get is better. Lol! I heard the queue in Nuri’s up to 1 hour, d*mnn… I’m kinda anti-queueing already. 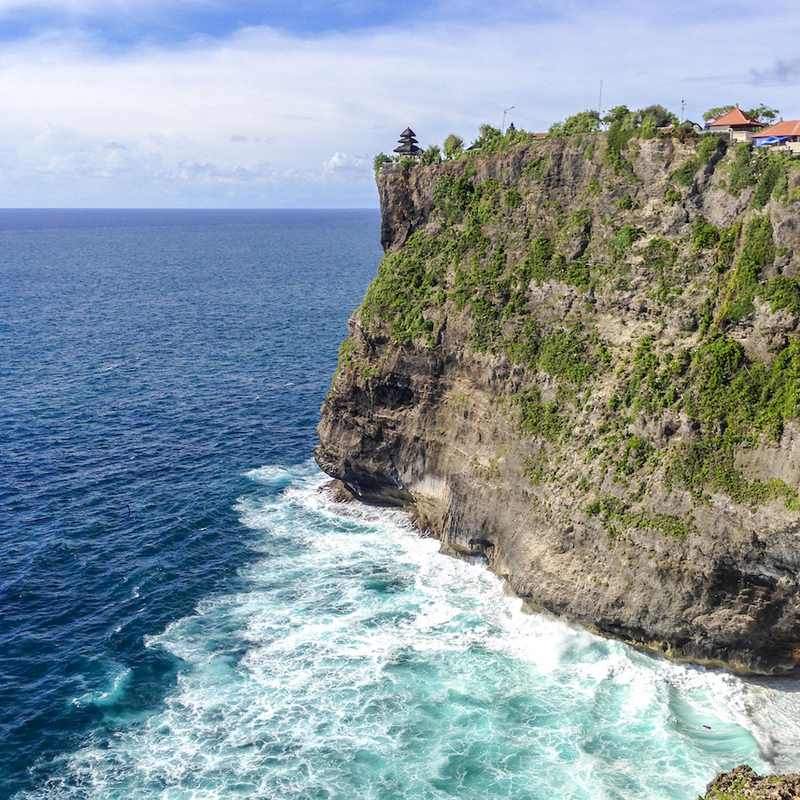 Our next stop, Uluwatu. This is one of the best views so far. 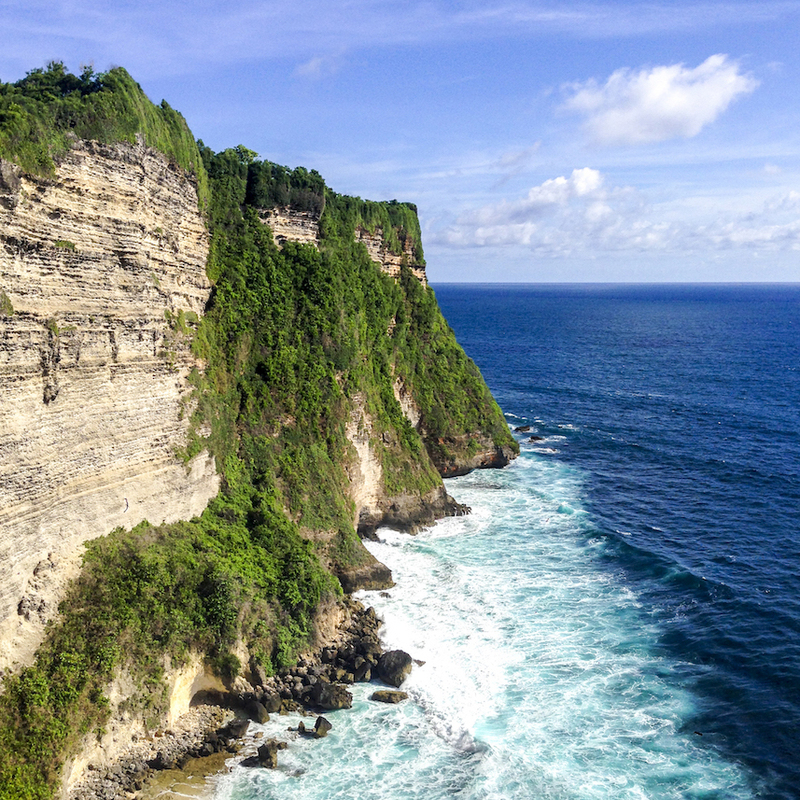 Located on the south-western tip of the Bukit Peninsula of Bali, Indonesia. 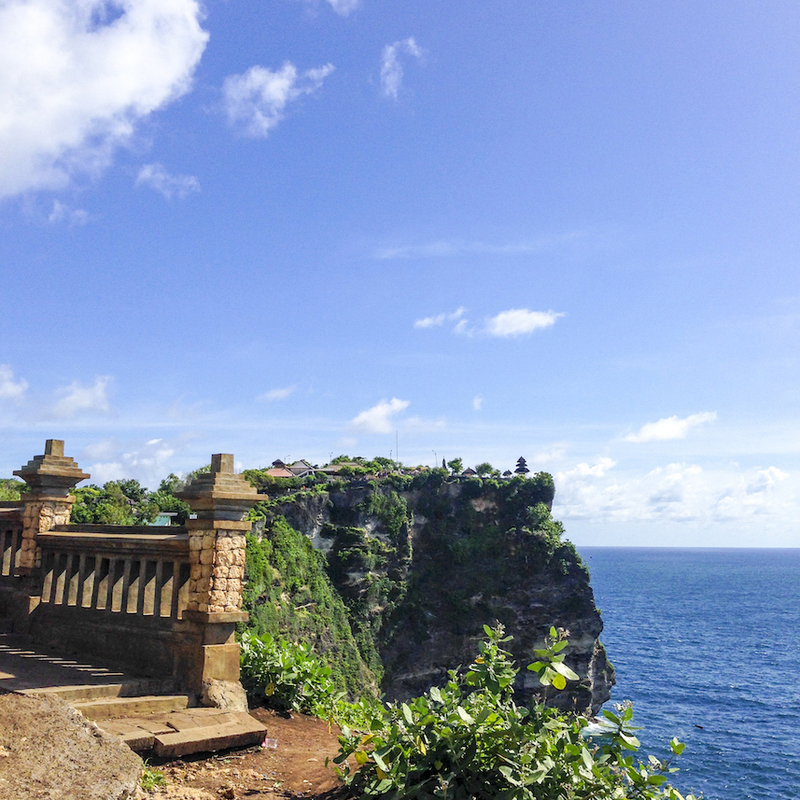 It is home to the Pura Luhur Uluwatu Temple. 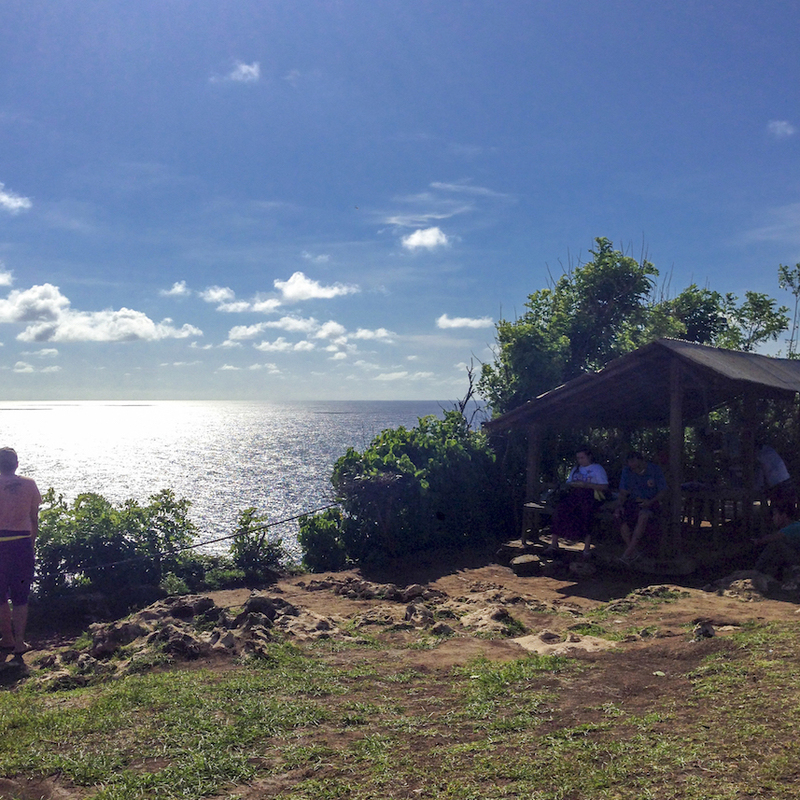 This place is well known for surfing too, number four surf destination in the world. 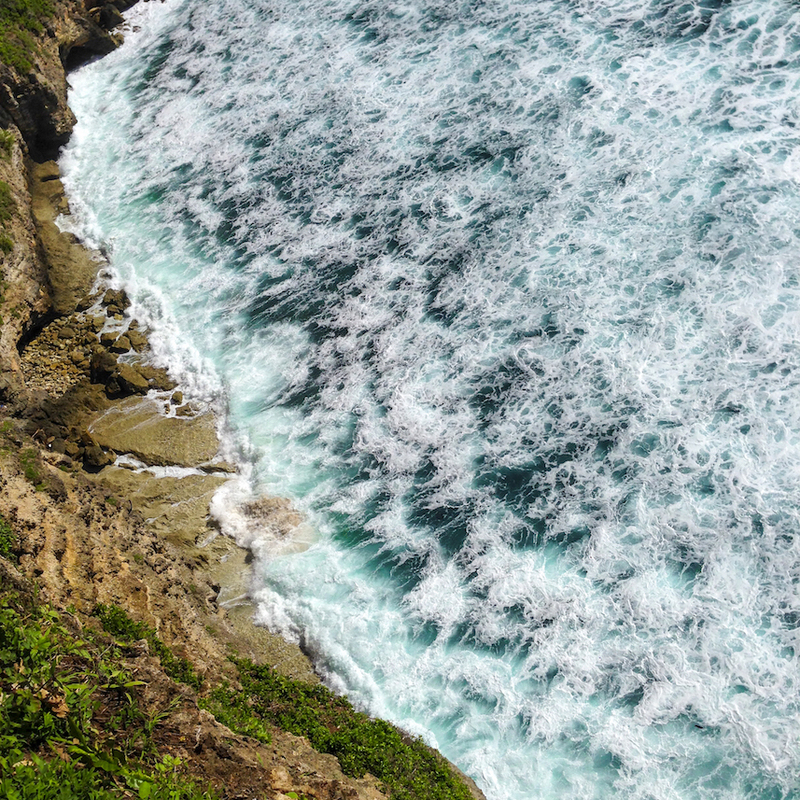 The name Uluwatu comes from ulu, meaning ‘lands end’, and watu, meaning ‘rock’. Check it out! To get here, we took 30 mins drive. And today’s sun was kinda unfriendly, it’s too bright and too hot. Queue at the entrance, and pay for 5K / car and 15K / person. You required using a shawl to wrap your lower body for men and for women. It’s just to honor the holy site of Pura Luhur. 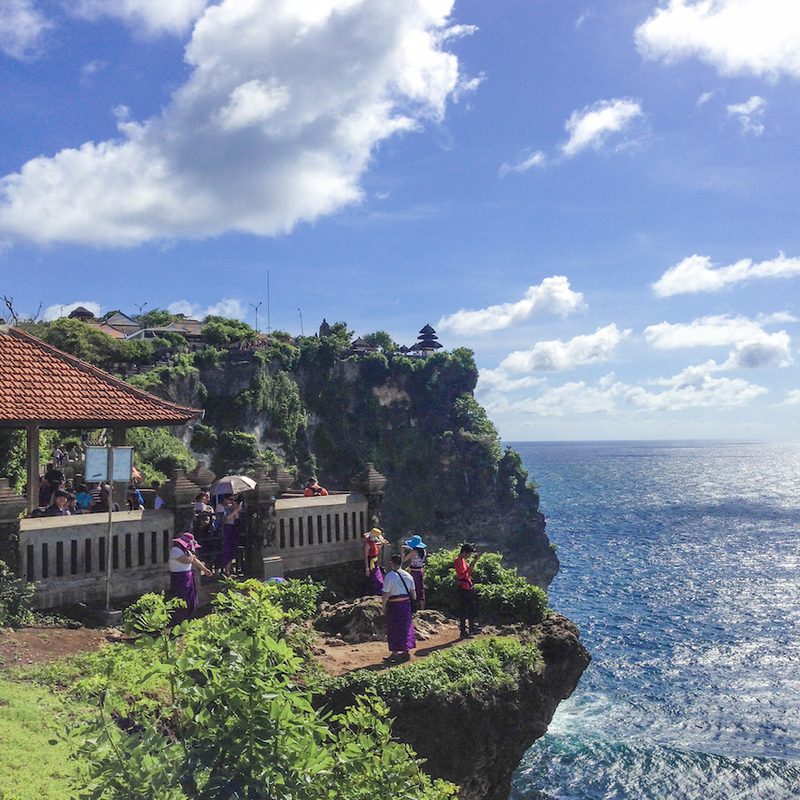 If you proceed to the left side, to the direction of the temple, you can see more beautiful cliff views. From this point, you can proceed to see more, but you’re gonna have to go through with a bit more effort. But these views are worth it. 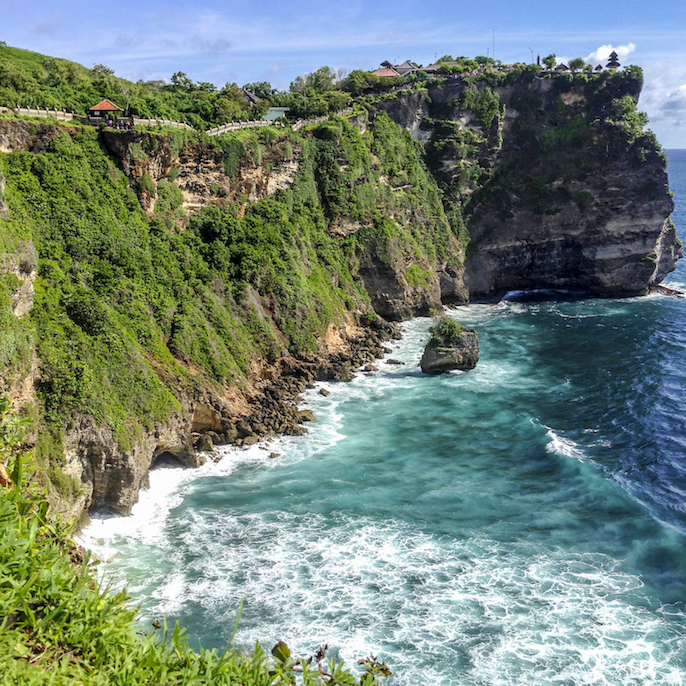 You can see more attraction in Uluwatu, such as Tari Kecak or monkey forest. But we skip that because we kinda get a headache because of the heat. It will be nice to see the sunset here while watching Kecak. As for the monkey forest, I’m not gonna recommend it here because there’s a lot of tourists got their belonging stolen, the monkey here is more ‘naughty’ I guess? Done with this place, back to the car for our next stop. By the way, coconut here is expensive 35K / coconut. It’s smart considering this kind of heat. Smart move, locals! We’re moving to our next stop, but before that, we made a pit stop at Gusto Gelato. They’re really good, the chasew and coconut are the best. It was 38K by that time, now maybe somewhere about 50K. They got a nice park for kids to play with. One thing about going here is the crazy traffic, we barely moving for 1 hour just to find a parking, when finally we decided to walk and let the driver take care of the parking spot somewhere, which ended up at the corner of the street, at a little mall I guess? 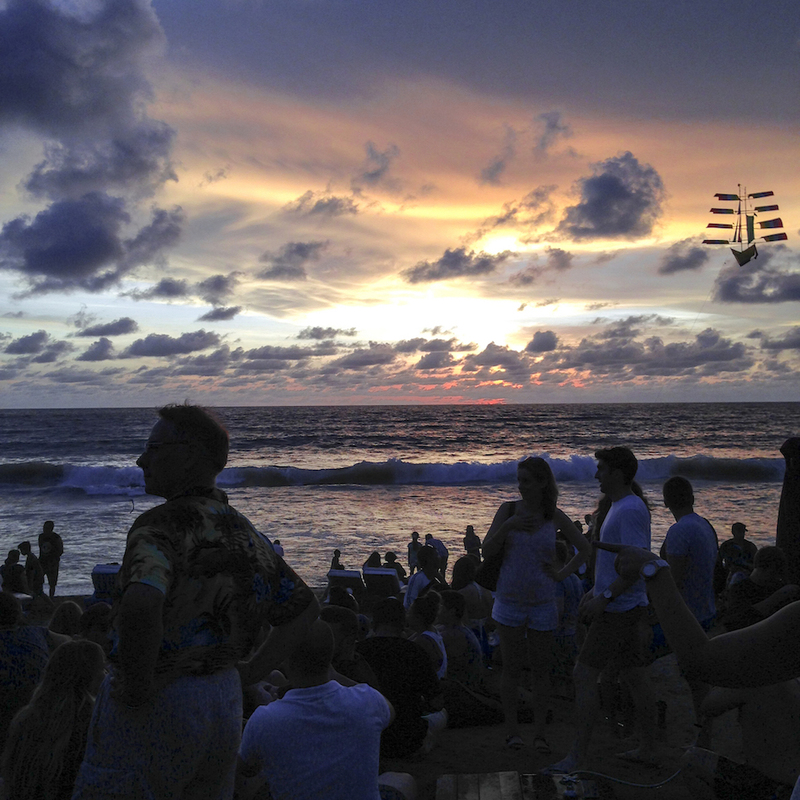 Ku De Ta, I Love The Bali Sunset Here! 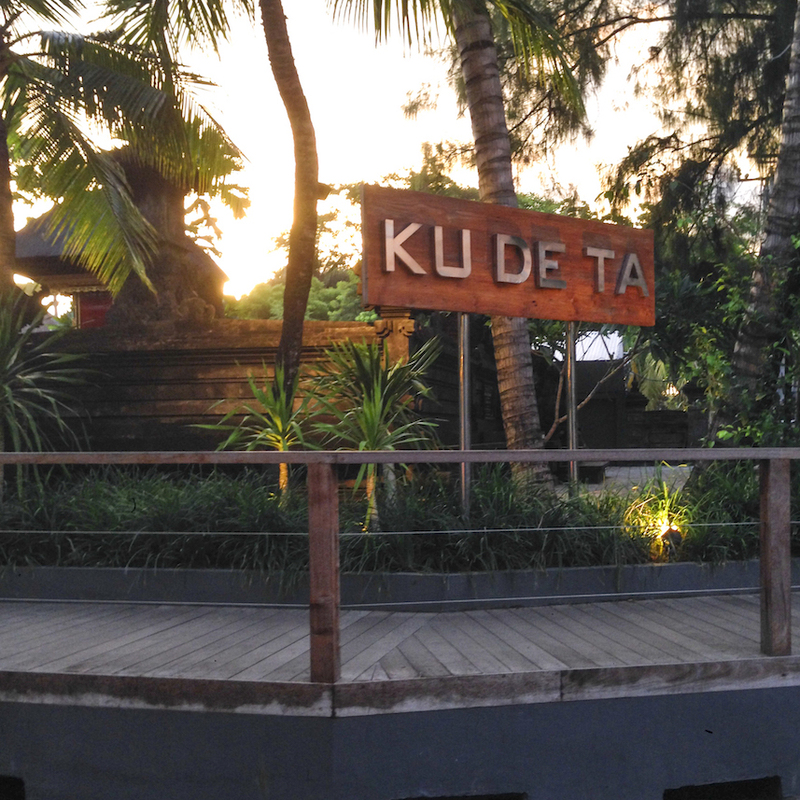 And finally, here we are… Yes, it’s the famous Ku De Ta. It’s the right decision to enjoy the Bali sunset here in Ku De Ta just before we fly back home tomorrow. Definitely one of the best sunset I ever had. What makes it better is, of course, the atmosphere. 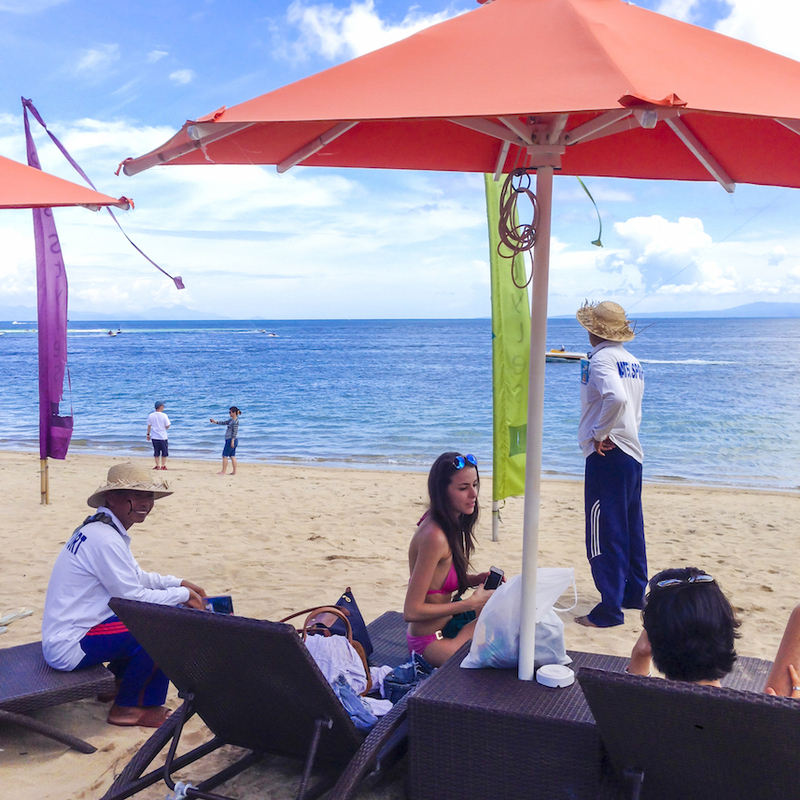 I think they succeeded in making a perfect beach club environment with a chill atmosphere. We’re welcomed by their staff, but one thing that is kinda weird was we barely can see anything inside, it’s so dark, maybe it’s on purpose for a specific kind of mood, I don’t know. But I would prefer a bit more light in the restaurant. We skip the restaurant, straight to the beach, where the sunset and the crowds there with a little party going on attracted us. And honestly, they had the best music here, their lounge music was really really heaven for my ear. Love it! See the view? Definitely one of the best, this time, the best sunset we had on our trip. I got a temporary tattoo for 150K just for fun while enjoying the sunset with beer for 25K. It’s really a satisfaction with this view. We didn’t eat here, although we planned to because it’s just too dark. There’s a lot of foreign tourists, more than locals here. After dark, we went back to our hotel while making a stop to shop for souvenirs at Krisna. This is kinda mandatory in Asian family when you travel somewhere, usually you have to bring back some food or items as souvenirs. Have to / mandatory / obligation. Hahaha.. Price still acceptable, range from 15K for food, and 3K for items such as keychain. Time shows 8.00 p.m. when we dismissed Mr. Made for the last time because tomorrow we’ll no longer use his service. We tipped him 300K for his service. He looks kinda happy. Later that night we had dinner again at Warung Andhika. Like I said, every night we go walk down the Legian street. This time, we spent time eating and drinking. Ending with us having a reflexology (health foot massage). You can find a lot of foot massage here, price differs from 60K up to 100K. And the next day we’re checking out from the hotel, booking a cab from the hotel which costs us 150K with meter. Had our last lunch in Bali before our flight home at the airport for another 70K / person. Yeaaa, I know, I know, it’s just we want to be with our family on new year’s eve. I know Bali has sh*t going down in new year’s eve party. Probably it’s party everywhere, all night long. But family is everything, right? That’s a wrap for our Bali series. That’s everything I would share in this travel journal. What do you think of my trip? Got a story to share? Please leave the comment below, I would love to hear from you. 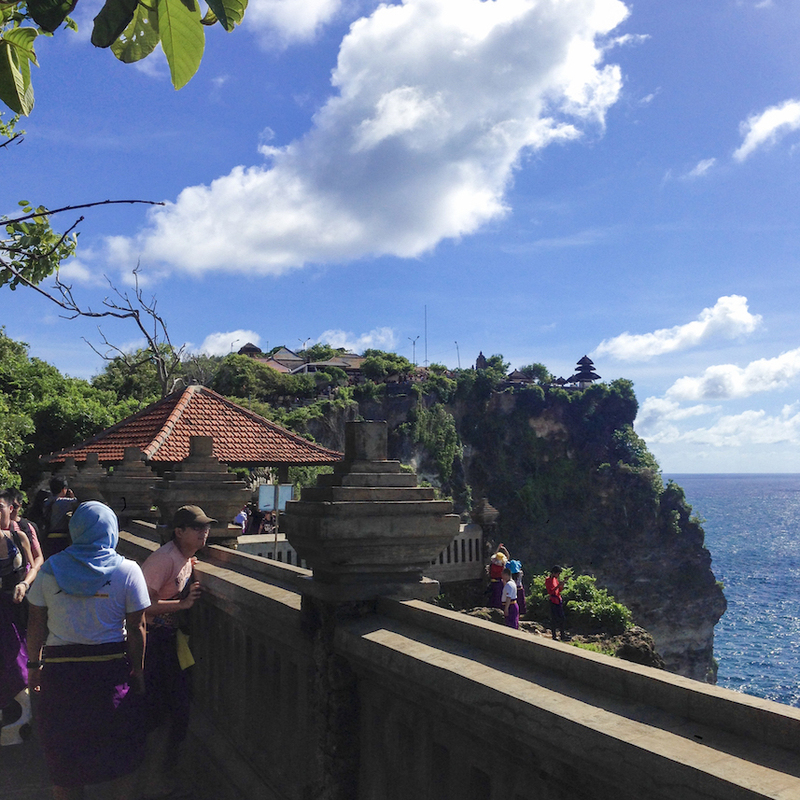 If you missed the earlier post, check out the story from Bali from the first day. Until next post, bye! If you’re interested with Conrad Hotel Bali.